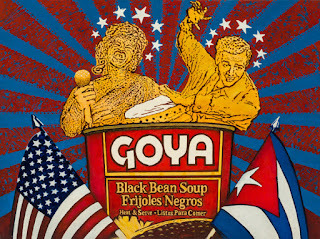 About a decade ago I co-curated for the Fraser Gallery a giant Cuban art exhibition which brought to DC many Cuban artists for the first time - it was called "De Aqui y de Alla" (From here and from there) --- see it here: http://www.thefrasergallery.com/artwork/Cuban-Show/Contemporary-Cuban-Art.html )" and it included many artists from Cuba as well as the Cuban Diaspora from around the world. Olga Viso (who is of Cuban ancestry), at the time at the helm at the Hirshhorn came by the gallery to see the show... the head of the Hirshhorn! Subsequently I curated a touring art exhibition of contemporary Cuban artists that I put together which traveled to DC, Philadelphia, Norfolk and Miami (Titled "Aqui Estamos" or "Here We Are"). In both cases the work avoided any and all contact with "government approved artists" and zero contact with the brutal Cuban dictatorship, and in fact, had somewhat of a dissident focus. 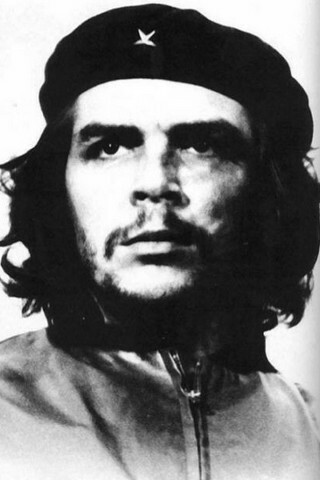 Of related interest to the theme, a local collector here in Chevy Chase owns a significant collection of Korda photographs, including the vintage photo of Che Guevara (Guerrillero Heroico) that Korda kept in his studio as his personal image of Guevara. The owners of the planet's most reproduced image acquired it directly from the Korda family, and I believe there's a video of the event (done as a provenance)... there are 19 photos in the collection - they were recently exhibited at the Museum of Latin American Art in California and the Jordan Schnitzer Museum at the University of Oregon and also at the Museum of Latin American Art in California. I've heard from major collectors of Cuban art, most of whom I know well, that Stephane Aquin, the new Chief Curator of the Hirshhorn Museum is in the process of curating an exhibition of Cuban art. He brings an excellent pedigree in the subject, as about a decade ago he was one of the curators of “¡Cuba! Art and History from 1868 to Today”, an exhibition at the Montreal Museum of Fine Arts. He selected Cuban work post 1959. Which brings me to an interesting issue. In the past decade, I have been part of multiple gift offers of work by blue chip Cuban artists to the Hirshhorn. In every single instance that I have been involved in, it has been declined. In every single instance, the declined work ended up in another major museum. 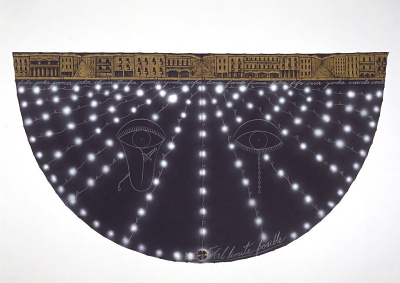 Work by Sandra Ramos (whose iconic work adorns the cover of Holly Block's bible of Cuban art, and that same iconic print is also in the collection of MoMA) has three times been offered as a gift to the Hirshhorn Museum by two separate collectors, and it was thrice declined. One Ramos ended up in the collection of the Miami Art Museum, one at the University of Virginia (which under the guidance of former curator Jill Hartz accumulated a superbly impressive collection of Cuban art), and one at Cornell University. It was because of that, that I welcomed the Hirshhorn's new library program to acquire supporting material by Latin American artists, and their blog post noted the inclusion of a catalog of Ramos' recent show in NYC. Of course, her American gallery solo show debut was in the DMV over a decade ago (in 2004 also at the Fraser Gallery - see http://www.thefrasergallery.com/DC2004.html). I'm desperately searching my storage for supporting materials of that exhibition, as that widely reviewed show was her first solo in an American commercial art gallery. That's a terrific new program that the museum has been funded to do - according to the Hirshhorn, the funds will be used to catalog Latin American materials that are in their 9,000 volume cataloging backlog. So far, they've identified 500 books and catalogs in the Latin American category, and they have catalogued around 200 of those, and they have one more group of 100 to catalog once the Cataloging Department has found contract staff to implement the last grant. It's a gigantic job, but it seems to be in good hands. Back to Cubans and the Hirshhorn. According to the Hirshhorn's website search, Ana Mendieta, Wifredo Lam, Jose Bedia, Los Carpinteros, Emilio Sanchez, Felix Gonzalez-Torres, and J.F. Elso (and the five prints by the "five") are the only Cuban artists in the museum's collection and many of those were part of the original bequest, indicating to me (as far as I can tell from the website) that the museum has not acquired very many Cubans since they opened. I could be wrong, but that's what it looks like. They did acquire this gorgeous Carmen Herrera in 2007. That was at least somewhat of a "discovery" as Herrera was not dubbed the "hot new thing in painting" by the New York Times until 2009. That NYT piece was done when she was 94. Herrera sold her very first painting... ever... in 2004, so the Hirshhorn jumped in early (2007), which colors my last paragraph in this post. Five gets you ten that the very gifted Olga Viso had something to do with that. In addition to the declined Sandra Ramos (three separate gift offers) that I mentioned earlier, the Hirshhorn has in the past (since 1996 to around 2008, which is when I gave up and stopped working as a middle man to offer them gifts from collectors of Cuban art) declined gifts of works by Maria Magdalena Campos-Pons, Cirenaica Moreira, Elsa Mora, Belkys Ayon, K'Cho, Aimee Garcia Marrero, Deborah Nofret Marrero, Tania Bruguera, Carlos Alfonso (multiple pieces from his estate), Roberto Wong, Korda, Roberto Fabelo, Marta Maria Perez Bravo, and Carlos Garaicoa... I may be forgetting some. Most of those ended up as gifts to other museums in the US (one ended up at the Tate in the UK)... it was curious to me the 100% decline rate, especially of some major works... this is the Ramos that ended up in the Miami Art Museum - it's the one titled "Ruinas de Utopia (Ruins of Utopia)" one of her key works dealing with the decline of Cuban life... Another painting from that page was also offered (the one titled "Rescate" )- that one ended in the collection of Cornell University. With Aquin at the helm, and his clear background in Cuban art, and with the funded interest in cataloguing peripheral material from Latin American artists, perhaps the Aquin and Hirshhorn will "discover" some other Cuban artists besides the "usual suspects," and perhaps the next time that an important gift by a blue chip Cuban artist is offered to the museum, it may find a home there. 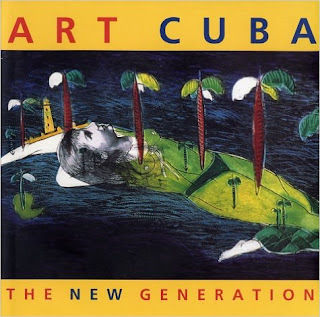 No one has asked me, and I suspect that no one will, but if Aquin reached out to me for some recommendations, and since all the Cuban artists' names mentioned in this blog post so far should be well-known to him, I would recommend a look at DMV Cuban-American artist Ric Garcia. 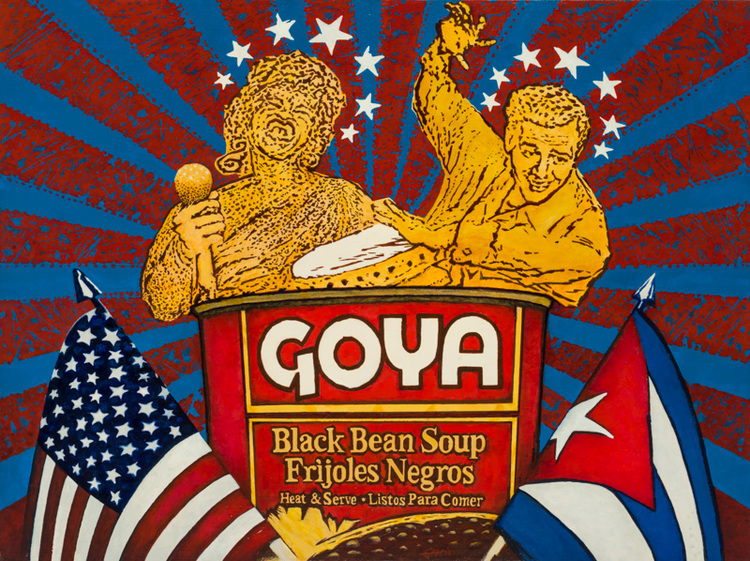 Wouldn't it be great if the Hirshhorn's Cuban show included a local with a singularly unique set of artwork? Just sayin'... time to "discover" rather than "re-do." The Bethesda Arts & Entertainment District is currently accepting applications for the twelfth annual Bethesda Painting Awards, a juried competition honoring four selected painters with $14,000 in prize monies. Deadline for slide submission is Friday, February 19, 2016. Up to eight finalists will be invited to display their work in June 2015 at a Gallery B in downtown Bethesda. The competition will be juried by Dorothy Moss, Associate Curator of painting and sculpture at the National Portrait Gallery and director of the triennial Outwin Boochever Portrait Competition; Dr. David Park Curry, Senior Curator of Decorative Arts, American Painting & Sculpture at the Baltimore Museum of Art and Megan Marlatt, Professor of Art and at University of Virginia. The first place winner will be awarded $10,000; second place will be honored with $2,000 and third place will be awarded $1,000. A “young” artist whose birth date is after February 20, 1985 may also be awarded $1,000. Artists must be 18 years of age or older and residents of Maryland, Virginia or Washington, D.C. All original 2-D painting including oil, acrylic, watercolor, gouache, encaustic and mixed media will be accepted. The maximum dimension should not exceed 60 inches in width or 84 inches in height. No reproductions. Artwork must have been completed within the last two years and must be available for the duration of the exhibition. Each artist must submit five images, application and a non-refundable entry fee of $25. For more information, or to apply online, please visit www.bethesda.org or call 301/215-6660. You may also send a self-addressed stamped envelope to the Bethesda Painting Awards, c/o Bethesda Arts & Entertainment District 7700 Old Georgetown Road, Bethesda, MD 20814. The Bethesda Painting Awards was established by local business owner Carol Trawick in 2005. Ms. Trawick has served as a community activist for more than 25 years in downtown Bethesda. She is the former Chair of the Bethesda Arts & Entertainment District, Past Chair of the Bethesda Urban Partnership, Inc. and founder of The Trawick Prize: Bethesda Contemporary Art Awards. Ms. Trawick is the owner of an information technology company in Bethesda, Trawick & Associates. Catriona Fraser, award-winning photographer, curator and juror is the non-voting Chair of the Bethesda Painting Awards. Ms. Fraser has directed the Fraser Gallery in downtown Bethesda since 2002. Ms. Fraser is also the Chair of The Trawick Prize and Director of the Bethesda Fine Arts Festival. The eleventh annual Bethesda Painting Awards was held in June 2016. Bill Schmidt of Baltimore, MD was awarded “Best in Show” with $10,000; Thomas Dahlberg of Baltimore, MD was named second place and was given $2,000 and Cavan Fleming of Blacksburg, VA was awarded third place and received $1,000. From award-winning theatre to independent films, downtown Bethesda’s Arts & Entertainment District is filled with inspiring artists and art venues. The Bethesda Arts & Entertainment District is managed by the Bethesda Urban Partnership, Inc., and is the producer of The Trawick Prize: Bethesda Contemporary Art Awards, Bethesda Painting Awards, Bethesda Fine Arts Festival, Bernard/Ebb Songwriting Awards, Gallery B, Studio B, Bethesda Art Walk, Dance Bethesda and Play In A Day.